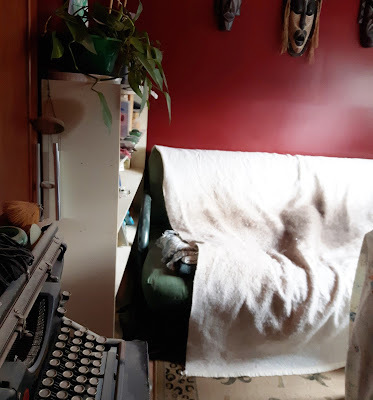 My Writing Journal: Hey, Wagon, Wait Up! I may have written a few more words, but I didn’t keep track of them. But yeah, I pretty much fell off the writing every day wagon last week. And I don’t even have a good excuse lined up, other than I’m still fighting my sinus cold. Now as to why I got no writing done over the weekend, I have excuses coming out the wazoo. Saturday I had a pile of errands to run, many of which took me out of town, and Sunday I was re-organizing closets plus I had the family dinner for Thanksgiving. This is what I’ll be dealing with today instead of writing. One of these days this is going to be my new office. That day will not be today, nor will it be tomorrow. If I’m real lucky, maybe by the end of next weekend. That whole desk like area has to be cleaned off and the stuff on it and in it relocated. That big sheet covered thing is my desk, and I’m not quite sure where I want it. Facing the window for sure, but right under the window? Halfway back from the window? Turned so it’s edgewise to the window? I have no idea. Then of course there’s the stuff from my old desk to bring over, which I can’t really do until my new desk is in its place. 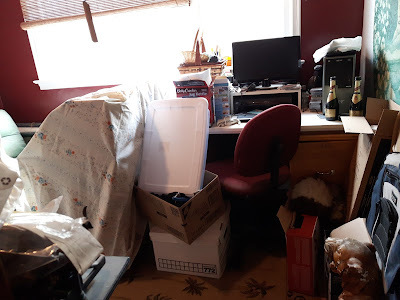 And most of the stuff from the desk area in the work room will be going on the old desk, which needs to be cleaned off first. You see my problem? Oh, yeah, and I’ll be bringing the narrow book case over from the current office to replace the white one. And don’t forget that futon needs to be dismantled. And that white blanket? Yeah, you can’t tell from the picture, but it’s not really white any more. It’s mostly dark grey. I put the blanket on the futon to keep the cat hair off it, but the cat likes to sleep under the blanket. Needless to say, add cleaning the cat hair off the futon to my list. All I have to keep in mind is the big picture - which is the satisfaction of sitting behind my dream desk in my new writing space. Then all that will be left is the writing.